If you have a particular course in mind you don’t even have to scroll the brief distance to where the 9 appear. Just use the large “search” box that appears along with the opening image. Whether on mobile or large screen computer, the group of 9 areas easily passes the “5 seconds or less” scan test that impatient visitors will appreciate. Adding “All courses A to Z” is a wise addition. 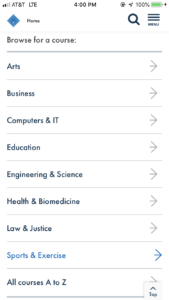 Many visitors will not know just where an individual program is binned within the various academic areas. Others may just want to scan the “everything we have” list before they go to an individual area. Here, that option is easily available. Google this month made major changes to the “Test My Site” tool. Among other points, speed is now rated using a 4G standard rather than the 3G level that Google told us until March 70 percent of people are still using to access mobile sites. Comparison with past Link of the Week mobile speed reports isn’t valid. Under the new system, the Victoria University home page was rated as “slow” at 5.8 seconds to download. A new point… Google now gives you the ability to add up to 9 URLs from competitor sites for comparative speed ratings. Do that. If the result shows that your site is slower than your key competitors that might give you new internal leverage to increase attention and resources to the need for a faster website. Every second you can reduce download time more visitors will stay with your page. 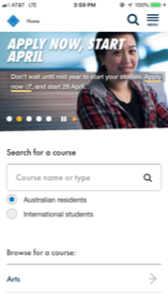 See how one university gives prominent placement to a top task activity for potential students at the Victoria University home page.